The year end is just around the corner, and it's high time to sum up what 2003 brought for 3D gamers. But today we will study one more production card based on the RADEON 9800 XT. The experience and other reviews on the net show that all of them are copies of ATI's original solution. 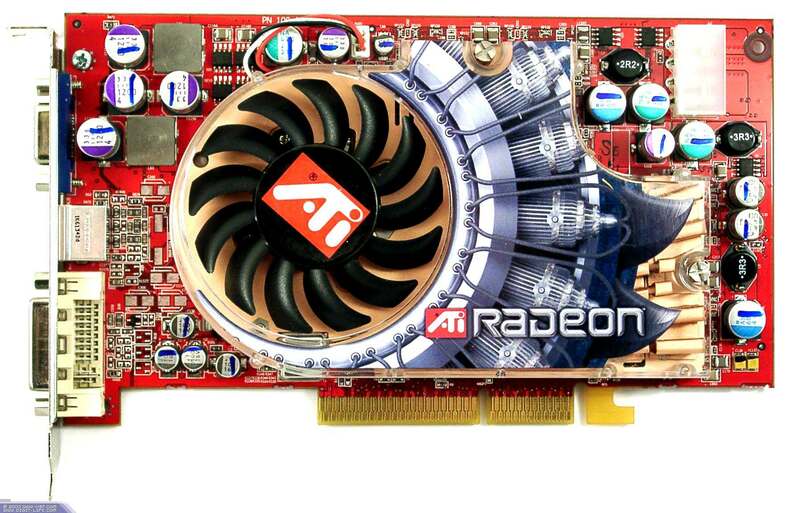 All RADEON 9800 XT are produced at the same factory and ATI's partners buy the whole cards to sell under their on trade marks. 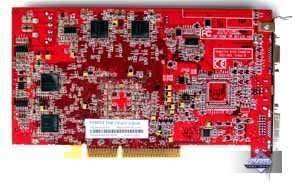 In the following reviews you can get more information about the architecture of all ATI's High-End products for the last 1.5 years. 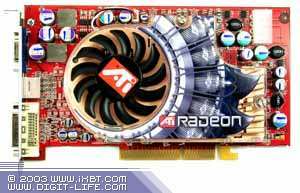 Let's get back to production versions of the RADEON 9800 XT. It's actually not interesting for an end-user to choose between different boxes with RADEON 9800 XT cards as the packs are standard: a software CD, a Half-Life2 coupon, a user guide, DVI-to-d-Sub, S-Video-to-RCA adapters and TV extension cords. The only exception is ASUSTeK which is based on the unique design, equipped with utilities, VIVO and other gaming software. No other companies try to discern their cards at all. The only difference between the boxes can be the price. 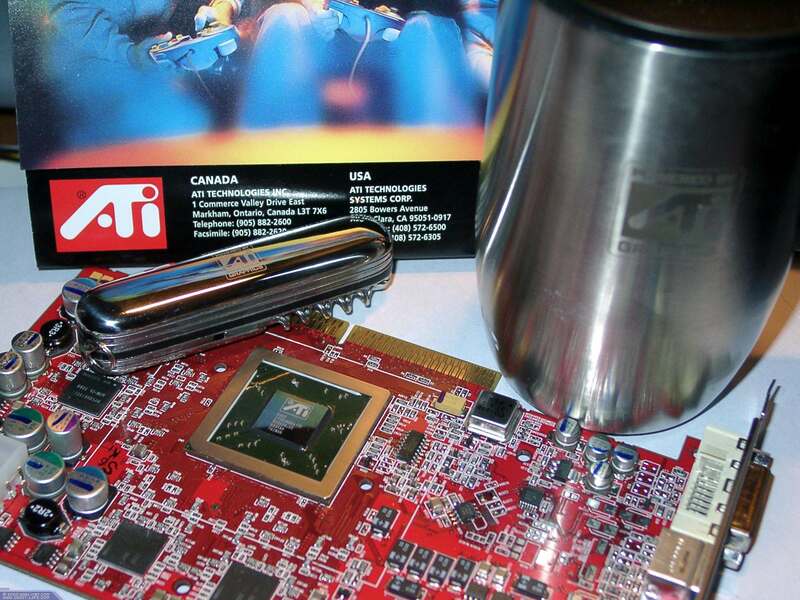 Most ATI's partners can hardly be called manufacturers as they simply purchase cards and provide their technical support. 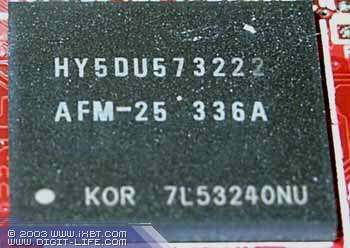 Hercules' cards are also based on the reference design but the chips are carefully selected because the card reliably runs at 445MHz instead of 412 MHz with the OverDrive enabled. 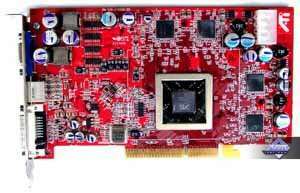 If you remember, in 1999, when Hercules Computer was an independent company, they decided to release exclusive NVIDIA Riva TNT2 Ultra cards overclocked up to 175/200 MHz from 150/183 MHz. 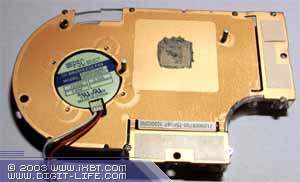 It resulted in bankrupt because there were few chips reliably running at 175 MHz (NVIDIA was also choosing chips for TNT2 Ultra from all TNT2). There was a great deal of TNT2 cards unneeded and few TNT2 Ultra which were in great demand. 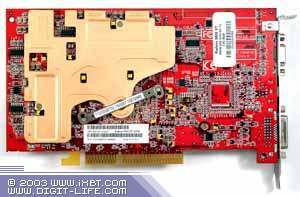 When I was testing the Connect3D RADEON 9800 XT 256MB the today's company reminded me the old times. Today the situation is different, and except the RADEON 9800 XT there are a lot of other products, that is why they won't go bankrupt even if the sales of the 9800 XT fail. 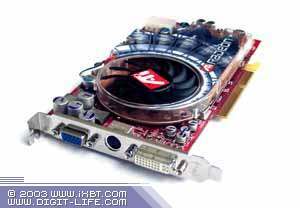 Besides, there are products the culled 9800 XT chips can be used for (RADEON 9800 PRO, RADEON 9800), and they are in demand. Let's get back on track. Connect3D is the European company and we often test its cards. All low-end and partially middle-end cards are produced at its own factory in China. High-End boards are bought from ATI and packed in its own boxes. This card looks similar; it just has better package relative to previous awful samples. 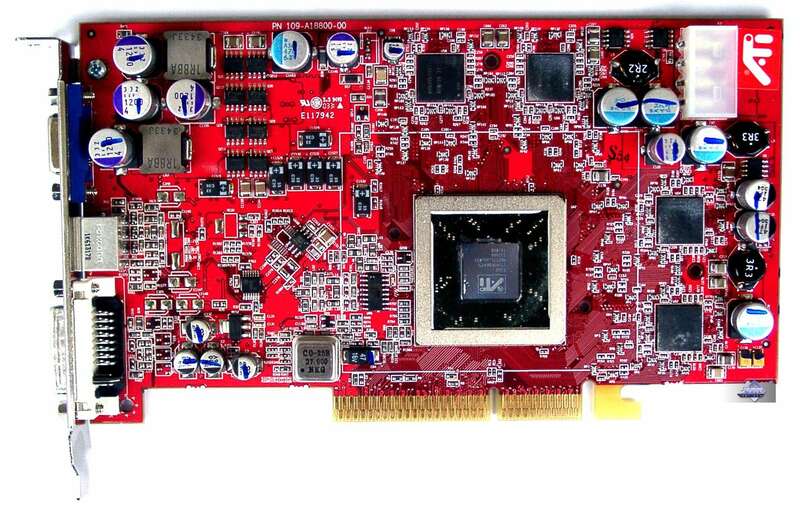 The card has AGP x8/x4 interface, 256 MB DDR SDRAM memory in 8 chips on both PCB sides. This is obviously a copy of the reference card. The cooler was already described in the basic review of the RADEON 9800 XT. Let me just outline it. The cooler is both beautiful and effective. 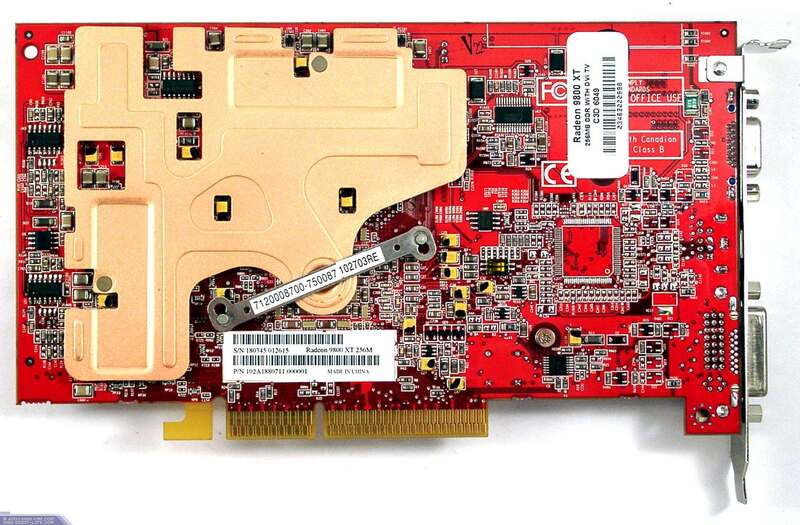 It's also pretty narrow, and the card takes only one AGP slot. 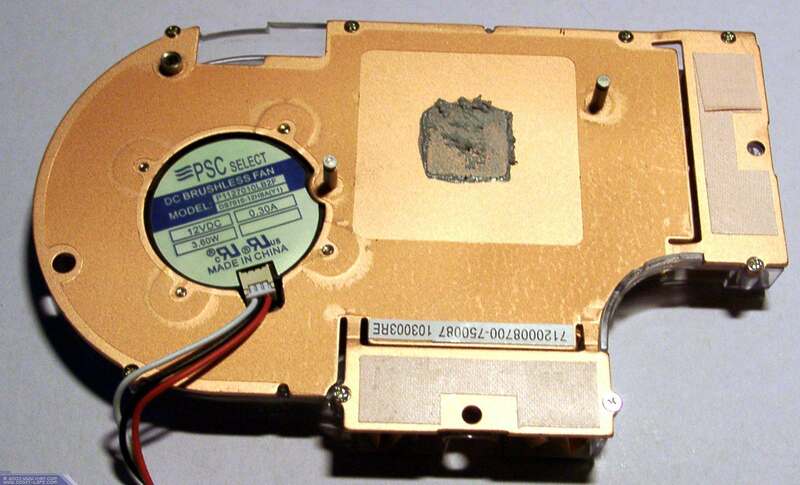 On the back is a copper plate attached to the memory chips with two buckles (both heatsinks are tightly joined with screws). A special jut on the plate is tightly pressed against the textolite where the core is located. 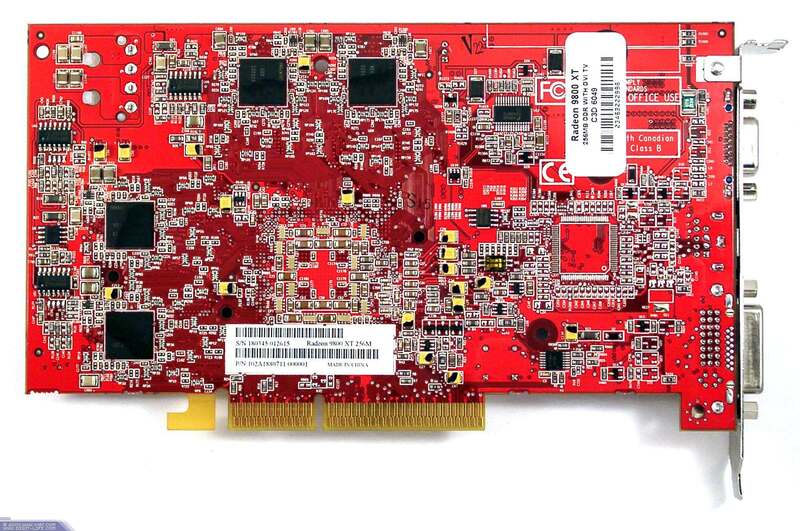 The cooler takes only one slot, and the first PCI is free and doesn't hamper cooling of the card. The fan is quiet (but it can raise its speed and start buzzing). However, some owners of the 9800XT cards say that the reference cooler is sometimes pretty noisy, but I haven't noticed it so far. The card has space for the Rage Theater 200, i.e. it potentially supports VIVO. Have a look at the package and the accessory pack. The design has improved relative to the awful boxes of the previous releases with daubed badly stuck logos. But anyway, it's not a good form to put a High-End product into a small tight box. Besides, the polygraphic quality is not that good because the card hasn't reached the store shelves yet and the corners of the box are worn out. 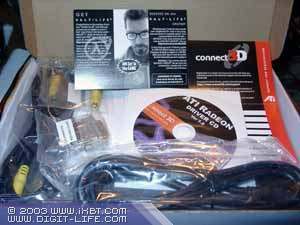 The box contains a user guide, a CD with drivers, a Half-Life2 coupon, TV extension cords, DVI-to-d-Sub and SVideo-to-RCA adapters, and an external power supply adapter. Aleksei Nikolaichuk AKA Unwinder has recently released the new version RC14.2 of RivaTuner which is able to detect chip's and card's temperatures. The OverDrive function included into the driver 3.8 is based exactly on the temperature results which are however hidden in the drivers. Aleksei detected card's temperature sensors in the drivers. 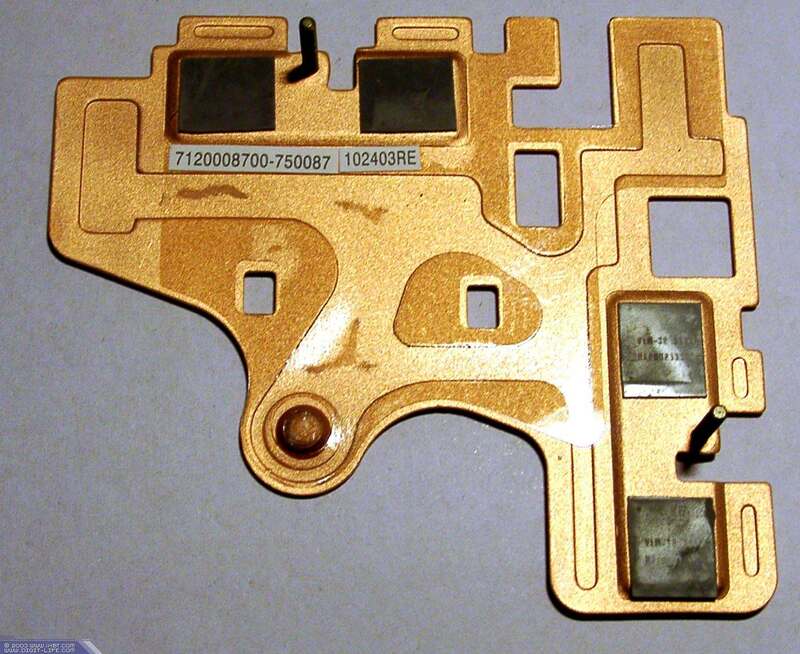 The control chip is located under the fan center (you can see it on the photo above - it's located under the angle of 45 degrees to the horizontal edge of the card). One of the sensors is installed next to the chip, the other - on back of the card. That is why the R360 doesn't integrate a temperature sensor like in the NVIDIA GeForce FX, the core temperature is detected by a sensor located next to the chip. At the default clock speed (without additional cooling) the temperature changes inconsiderably and hovers around 50-52 degrees. With the OverDrive enabled the core clock can be raised up to 432 MHz only if the chip's temperature is not higher than 35 degrees. 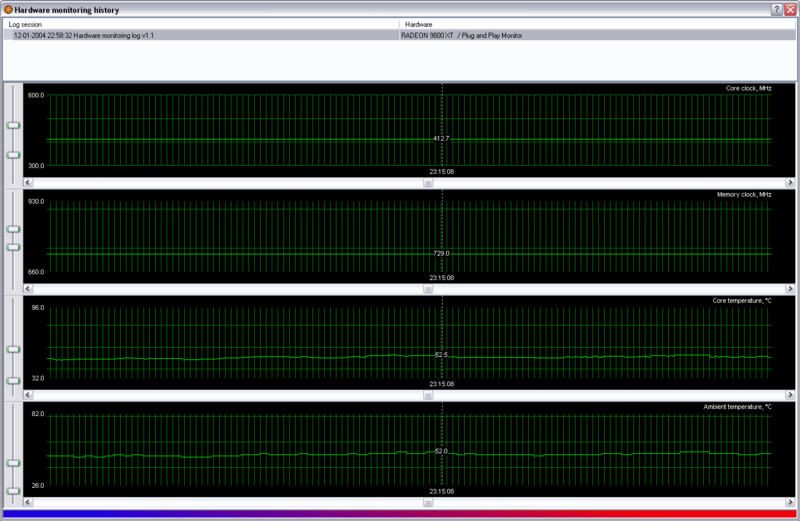 Otherwise, it rises only up to 418 MHz (and at 55 degrees the core clock falls down to the default one). Judging by the temperature diagram, the OverDrive is a fiction because even at a light load the temperature exceeds 50 degrees. What if we overclock the card (without additional cooling)? Here the temperature rises faster. At 55 degrees the card overheated and hung. 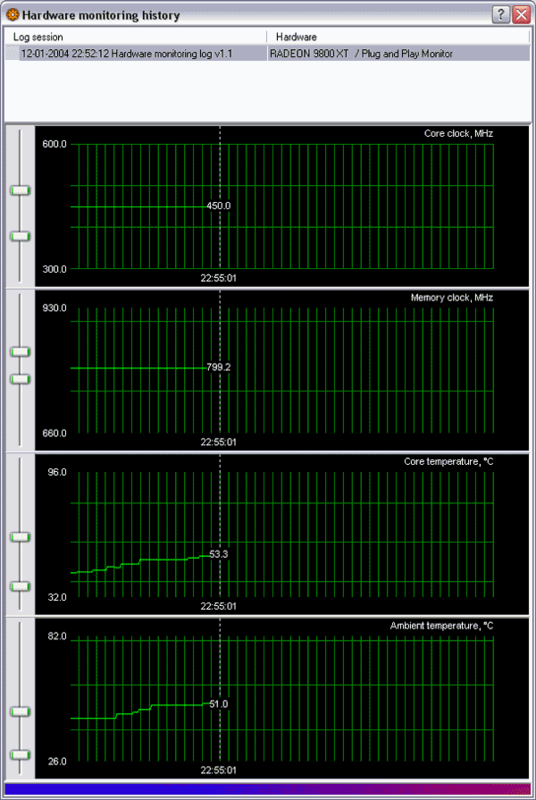 With additional cooling the card reached 465/800 MHz. The card tested today is just a copy of the reference ATI RADEON 9800 XT! All the components coincide! The only determining factor is the price. If it's acceptable, the card will be in demand (if there's any demand for $500 cards at all). Let me just remind you that the RADEON 9800 XT is the most powerful accelerator today (taking into account modern DX9 tests). However, they do have problems with quality of the latest drivers). But as reported, the prices for the GeForce FX 5950 Ultra are rapidly falling down, that is why even in such a small market sector (0.1%) users would prefer the latter in spite of its downsides. ATI and its partners should remember that. Also I should say that while ATI prints out Half-Life2 coupons, NVIDIA and its partners have agreed upon supplying the up-to-date and highly rated Call of Duty game with their High-End cards.